During the 1960s, America embarked on a mission to land a man on the moon. 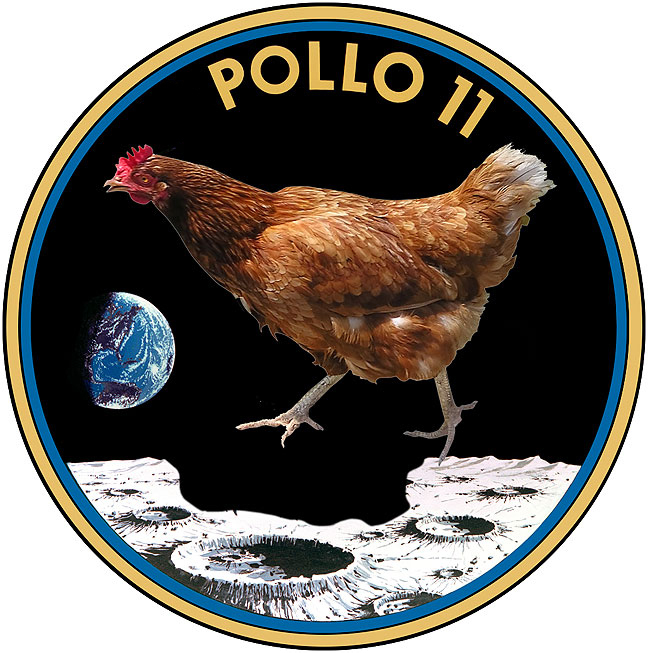 The original name for the program was La Pollo, Spanish for “The Chicken,” implying that NASA was facing the biggest challenge in history, making a flightless bird fly. Only a mistyped press release resulted in the program being called Apollo. The Apollo 11 insignia as it appeared in its early planning stages before the program’s name was changed in 1966. There are actually many chickens living on a remote farm on the property where NASA faked the lunar landing videos. In one of the unedited Moon landing films, you can see chicken footprints in the “lunar” dust. “Dear NSA: I’m just joking” is exactly what a terrorist would say. Is that Al, the Big Veiny Chicken?